Kernels Class Of 2018 "Should Be Pretty Entertaining"
It seems like just yesterday, doesn't it? The Minnesota Twins and Cedar Rapids Kernels were entering the very first year of their brand new affiliation agreement in the spring of 2013 and there was plenty to be excited about with the baseball talent the Twins were planning to send through Cedar Rapids that season. Three of that year's Kernels had been handed signing bonuses of over $1 million and 11 more from their opening day roster that season had received six-figure bonuses. In short, it was as loaded as any Cedar Rapids roster had been in several years. Optimism was high and not only for the Kernels. That Cedar Rapids class of 2013 represented, to many, the future of the Minnesota Twins franchise - a franchise that had fallen on tough times after nearly a decade of postseason participation. As with any roster of Class A ballplayers, you don't have to look too hard to find players that, despite being early round draft picks or well-regarded international free agents, would ultimately fall short of their goals of having successful Major League careers. But you also don't have to look far down that 2013 roster to find names that have since become part of the core group of players that led the Twins to a wild card berth in 2017, with even greater expectations for the next several seasons. Byron Buxton and Jorge Polanco were on that opening day roster in Cedar Rapids in 2013, as were pitchers Tyler Duffey and Taylor Rogers. Then there were two more mid-season additions to the Kernels that are also now playing major roles in Minnesota, Max Kepler and Jose Berrios. Several additional Cedar Rapids alumni are poised to contribute to whatever success the Twins have in the near future, as well, but that class of 2013 will long be remembered by Kernels fans. But is it possible that the class of 2018 could end up being even better? It's certainly not impossible. The class of 2013 had Buxton, the Twins' 2012 first round pick in the amateur draft (second selection overall), but the 2018 Kernels roster will include a pair of first rounders. Shortstop Royce Lewis, the first overall selection in 2017, will start the season in Cedar Rapids after suiting up for the Kernels for the final month of the 2017 season. He will be joined by the Twins' first round pick in 2016, as well. Outfielder Alex Kirilloff missed last season after elbow surgery, but will wear a Kernels uniform on Opening Day this year. That's not bad for a start, but when you look over the Kernels' roster, It's easy to find plenty of other players who were highly touted draft picks and international signings. 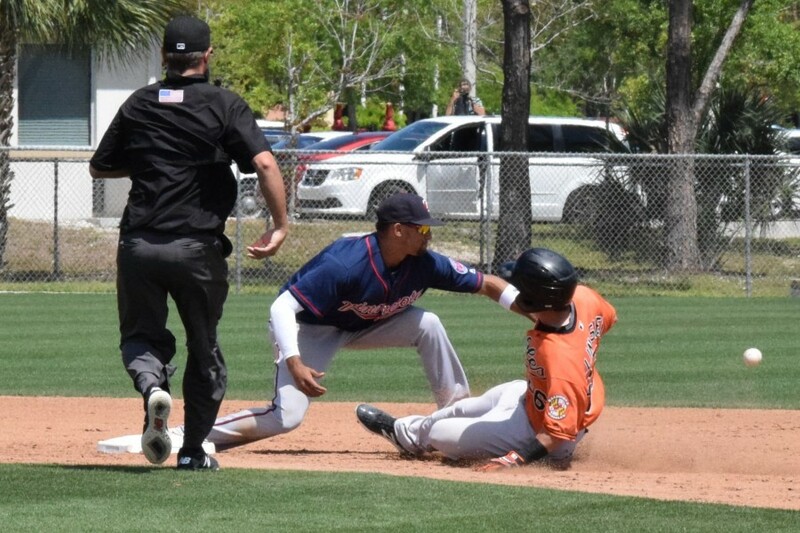 That group includes two Compensation round picks, outfielder Akil Baddoo and infielder Jose Miranda, and a second rounder, catcher Ben Rortvedt (who spent 2017 in Cedar Rapids). Right handed pitcher Blayne Enlow was selected by the Twins in the third round of 2017's draft and will open 2018 in Cedar Rapids' rotation. Trey Cabbage, who is slated to be part of the Kernels' outfield, but could also play the corner infield spots, is also returning to Cedar Rapids, where he finished the 2017 season. Cabbage was the Twins' fourth round pick in 2015. The Kernels will have 2017 fifth round pick Andrew Bechtold at third base and David Banuelos, who was Seattle's fifth round pick in 2017, will share time with Rortvedt behind the plate. Banuelos was obtained by the Twins from the Mariners over the off-season in return for a million dollars worth if international bonus cap space. Lewis, Rortvedt and Cabbage aren't the only Kernels alums who are returning to open the 2018 campaign. Randy Dobnak, Bryan Sammons and Tyler Watson are all slated to open the season in Cedar Rapids' starting rotation after seeing time with the Kernels last year. Logan Lombana and Ryan Mason return to the Kernels' bullpen after playing key relief rolls for Cedar Rapids in 2017. Infielder Jordan Gore and ouitfielder Shane Carrier also returning to Cedar Rapids to open the season. Other players slated to suit up for the Kernels for the first time to start the season include pitchers Nick Brown, Edwar Colina, Calvin Faucher, Jared Finkel, Kevin Marnon, Jose Martinez and Jovani Moran. They'll be joined by first-time Kernels position players Ben Rodriguez (1B) and Mark Contreras (OF). New Cedar Rapids manager Toby Gardenhire is optimistic about his Kernels and knows he's being entrusted with a number of the Twins' most prized young prospects. "It should be a lot of fun. We've got a really good group of kids," Gardenhire said as spring training was winding down. "They've been playing really hard and they're ready to get (to Cedar Rapids), I know that. "We're definitely young, but there's a lot of guys that have a lot of ability - a lot of talent, that the Twins think very highly of. It makes them fun to watch. I've been watching them all spring and we've got some exciting guys, so it should be pretty entertaining." Today's Twins fans are hoping that Buxton, Kepler, Berrios and other Kernels alumni of the past five years will lead the parent club through a period of postseason success. Five years from now, will the Cedar Rapids class of 2018 be preparing to step in and join - or perhaps take over for - their predecessors? But Kernels fans in Cedar Rapids will soon be getting a good opportunity to see just how good this next wave of young Twins prospects can look. The wife and I are already planning a trip to see the Kernels this summer. Three hour drive away so we'll stay overnight and catch a couple of games before heading back. Excited to say the least. Would be nice to have Mother Nature shape up so we can enjoy the home opener!!! The next wave of “extended spring trainers” will only make them better, but they’re probably waiting on advancing a few of the Kernels before they come on up from Florida. I think that will be a pretty tough lineup for other teams to face.I am a little surprised that Wander is not included in that group but I guess maybe they hope that Lewis is ready for High A by mid season and Wander comes up to replace him then.I wish them all well and hope for another great Low A season. Wander Javier would have likely been on the Kernels' opening day roster but was sidelined with an injury the last couple of weeks of ST (the nature is escaping me at this moment, but I don't recall it being overly serious) and was listed on the "DL" at the end of last week. Is Tyler Watson the guy they got in. The Kintzler trade? I was thinking he was in Ft Myers last yr. I read somewhere awhile ago that it was his shoulder, I think the right one.Don't have a clue as to what it was or how serious, however, with the weather being what it is seems to make sense to wait a month. Yes, Watson came from Hagerstown. I really like the kid. Surprised me that he chose to go pro when he was drafted out of high school in the 34th round. When you’re 6’5” and throw left with at least some velocity in high school, you’d think you’d have D-1 offers like crazy where he could’ve invested in himself instead of getting a measly signing bonus out of the late rounds. Truly hope things work out for him though. He was definitely trending upward after being in the Sally League ASG. As his adopt-a-prospect dad this year I learned he was committed to attend Loyola Marymount, and the Nationals paid way above slot ($400k) to entice him to sign. If you're at games in person when he starts, please feel free to post on his page! For Wander, it is his LEFT (non-throwing) shoulder. When I was there, he was running and throwing and fielding. The only thing they didn't have him doing yet was hitting. He may be by now, but I'm sure they'll want to get him some live batting practice in some Extended Spring Training games before sending him up to the Kernels. It may be the type of minor injury that the cold would not be good for. He made 6-8 starts for the Kernels last year after joining the organization. Wow, that is quite a stash at CR! They are going to be an exciting team to follow this year. I just might have to get out of Chicago to see them play (but I might only get as far as Kane Co. or Beloit). And as a reminder, if anyone is still interested, there are many Kernels still available in the Adopt-a-Prospect forum! It's a great way to follow the team and individual players. Check it out! 1-3 musta got rained out then, because his b-r.com record shows 5. Thanks for the article. Great photos! When is a final roster not REALLY a final roster? When the organization starts shuffling the deck before the first pitch of the season is even thrown! Logan Lombana is on his way back to Ft. Myers to join the Miracle and the Kernels get Moises Gomez from Extended Spring Training. For those curious... The Miracle announced today that Adam Bray and Tom Hackimer will start the season on the DL. Max Cordy has been activated, and then they've added Lombana too. Rortvedt/Banuelos are both legit catcher prospects with solid defensive reps. Will be interesting to see how things shake out at the plate for the pair over the course of the season. Is the lefty, Riley Widell, starting out with the Kernels this year?If not, I'm sure he'll get a chance at some point. This will be a really exciting team to watch. Nice write up! I thought Widell might be assigned to CR, too, but must have just fallen victim to the numbers game. There are only so many SP slots available in full season ball to start the season. Assuming he's healthy, I would expect him to be one of the first SP promotions as spots opened up, if what little I saw of him in ST is a factor. I thought he looked good enough to compete at the Low A level. This is indeed a valuable crop of prospects. Any information on the background and philosophies of the hitting and pitching coaches? He could be a diamond in the rough. Thanks for the info. I should've done more research on that measly signing bonus. I'm sure Falvine did plenty of their due diligence, per usual, prior to acquiring him. He seems to be a pretty humble kid. → Article: Kernels Class Of 2018 "Should Be Pretty Entertaining"